Ok, let me just say straight up that I'm not a huge fan of Chevrolet Racing. Having spent my youth in a 1970 440-6 Challenger, I was a dyed-in-the-wool MOPAR fan for many years. Later I became enamored of Ferrari and Aston Martin: Chevrolet was never in the mix for me. However, it is impossible to deny the successes claimed by C5 and C6 Corvettes in the GT classes. The C6.R is, simply put, spectacular. And it doesn't hurt that it happens to be so bad-### looking. 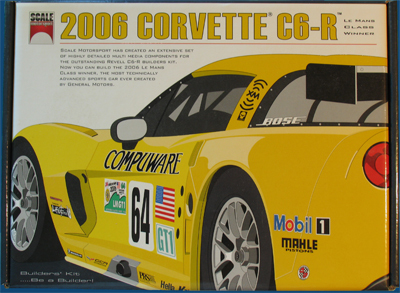 So despite the fact that I'm not a Chevy-lover, building a model of a C6.R was sort of an obvious choice. Unfortunately, the only mainstream kit available is from Revell, and while it captures the overall look of the prototype, the kit is sadly lacking in important details - driveline, suspension, and interior to name a few. So even though I had the kit in my stash, I wasn't in a hurry to build it. Sometime in mid-2008 I was corresponding with Matthew Wells at Scale Motorsport about obtaining a replacement part for my Ferrari F2002 detail set (I still have yet to follow up on that issue) when he mentioned that he was in the final stages of design for what, in his words, was going to be a stunning detail set for the Revell C6.R. His level of excitement was obvious, so I added my name to the waiting list for the kit and in a few weeks, one of the first ones showed up on my doorstep. I would be surprised to find even a casual automotive modeler out there who is not familiar with Scale Motorsport. Matthew began by providing high-quality decal sheets of carbon fiber weave (I used some of his early products on my first Pocher F40), and has steadily built and expanded SMS into a highly-regarded provider of a wide range of automotive detail sets. I've seen lots of comments on the 'Net regarding the relatively high price of SMS product, and have just two things to mention: car modelers tend to be a "thrifty" lot (no offense, but you car-modeler guys know I'm right), and the quality of SMS products is absolutely first-rate. Upon completing a quick review of the newly-arrived C6.R kit, I was happy to see that Matthew had once again worked his typical magic: the wheels are stunning, and the PE and resin parts are equally inspiring. Typically I would have dived right in and started work: however I was busy on a number of other projects (modeling and non-modeling alike), and was forced to set the kit aside - but not too far aside. Finally, in early April '09, the opportunity presented itself to work on this kit, so out it came from the stash. I decided to document this build in "real time" rather than waiting until after work was complete, so if you're interested, you'll have to check back periodically as work progresses and I add content. UPDATE: January 25, 2010. Well, ok - it took longer than anticipated, but hey, I had to replace a fireplace from foundation to chimney cap, build some custom cabinets in the kitchen, in addition to running my business... but here it is, complete save for a couple minor parts. Use the menu at left to navigate to the construction page(s).